Amaranthus Bicolor (Illumination) - Looking for something to illuminate your flower garden that is easily grown from flower seeds? Look no further than Amaranthus Illumination which provides fiery color for months during the summer! Illumination will stop your friends, family, and neighbors in their tracks and ask about this wonder flowing plant grown from flower seeds. Each tall, sturdy column has bright green leaves below a densely-packed eruption of gold and crimson foliage that stays colorful from midsummer clear until frost season begins. Just wait until the warm weather begins and the magnificent colors start to burst from this sun loving Amaranthus. The upper portion of this three to four foot tall plant is devoted to the brilliant foliage, while the lower two-thirds remains green. 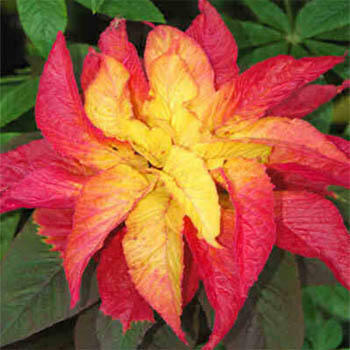 Many people refer to this Amaranthus as a Summer Poinsettia; however, this one is much easier to grow! Amaranthus is ideal for warm, sunny, well-drained spots. It makes a superb background accent, hedge, or border subject. Once established for a few months, it needs very little water to keep it thriving.